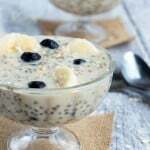 Blueberry banana overnight oats – prepare your gluten free oatmeal in the day before consumption with this banana blueberry with chia seeds recipe. 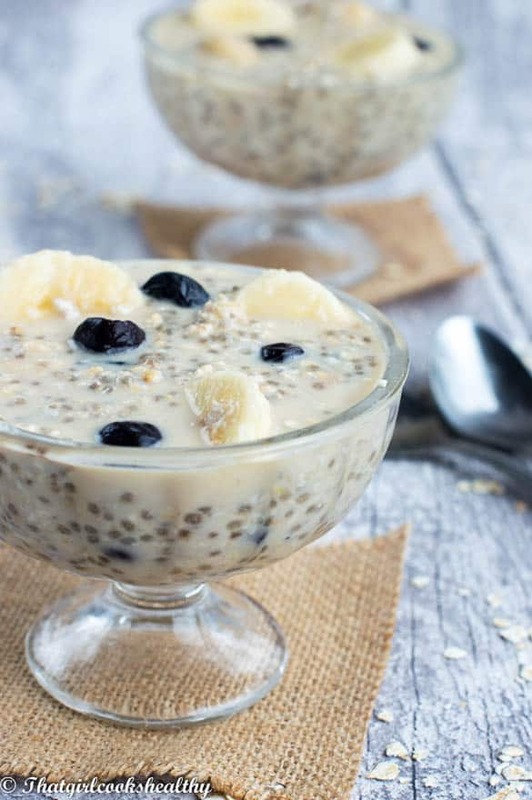 I’m sure you have probably heard the hype right now, that is overnight chia seed oats . I have also hopped on the oatmeal wagon, to a lesser extent with this blueberry banana overnight oats. 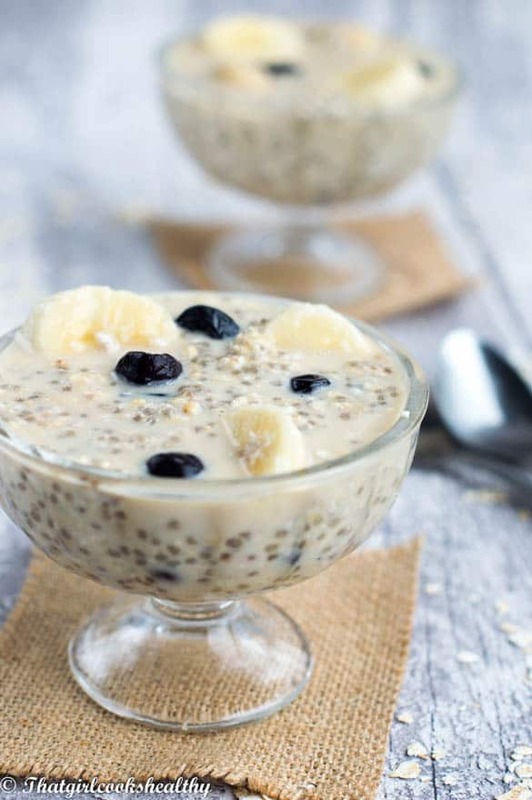 I have always enjoyed eating oatmeal but preparing them the night before with chia seeds using a small handful of ingredients makes them oh so tempting. I could easily eat this for breakfast everyday but since I like to diversify, I can’t see myself doing so. As we all know breakfast is the most important meal of the day, while I am on the subject, let’s be candid here, how many of you actually eat breakfast in the morning? Do you lead a hectic lifestyle that warrants a non stop attitude? Are you too lazy to fix yourself something to eat in the mornings? Perhaps you’re indecisive about what to eat? I have broached this topic many times before throughout my life and have heard all of the excuses above. I’m not chastising anyone for their decision not to eat first thing in the morning, but I do want to point out the importance of commencing the day on a full stomach. You see after sleeping for such a long period of time, while your body has had a chance to re-energise and restore its balance, it needs some sustance to recover from not eating for several hours. This is where the term breakfast derives from because you are breaking the fast (breakfast). I personally cannot leave the house without a bite to eat, I ALWAYS and I mean ALWAYS eat breakfast, whether it’s a bowl of fruit, smoothie, blueberry banana oats or an omelette, Charla is eating before she heads out. I need my energy levels optimised before I start the day, if I didn’t my blood sugar levels would plummet leading to hypoglycaemia (low blood pressure). It’s not uncommon for people who skip breakfast to feel faint, tired or dizzy throughout the day and unbeknown to them these symptoms stem from not eating breakfast. It is so imperative to eat something in the morning , you owe it to your body. 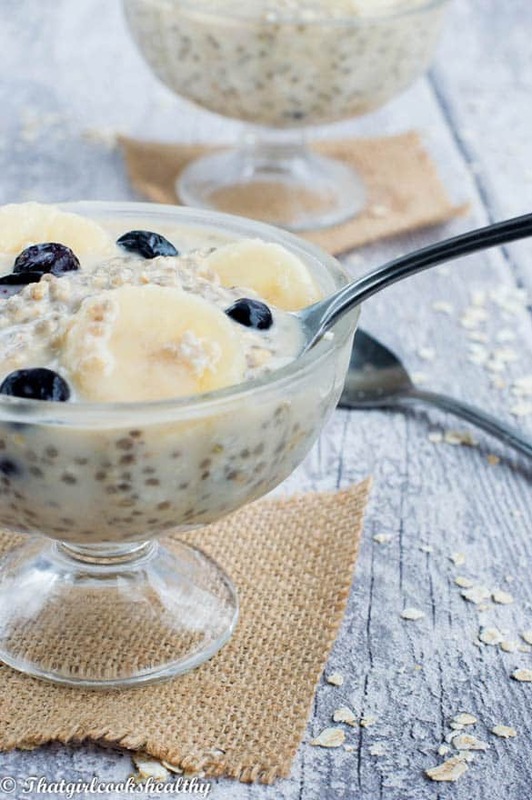 There’s no excuse now not to consume breakfast since this blueberry banana oats recipe comes together overnight. All you need is a mason jar or small bowl to house the oatmeal. Most of the work is done during the night, when the chia seeds along with the oats swell and expand. 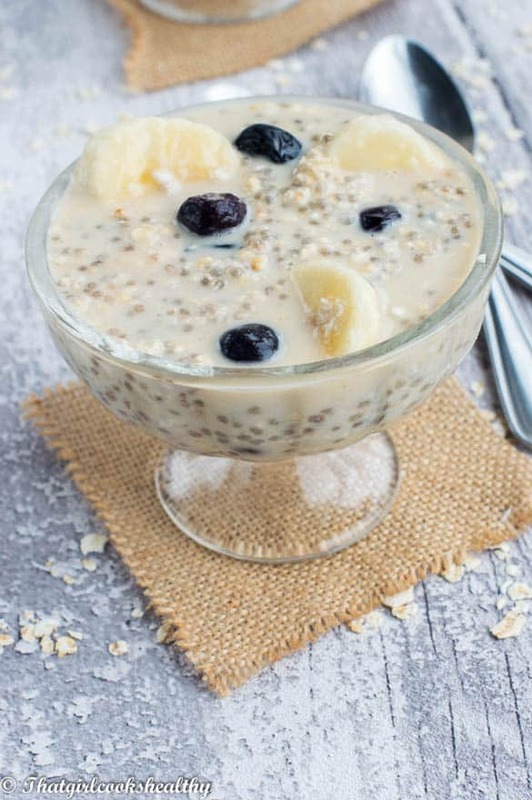 They congeal with the nut milk creating a creamy chia seed oatmeal coupled with some bananas, blueberries and a hint of cinnamon, that sounds like heaven to me. The good thing being there’s zero prep work other than pouring the ingredients into a small bowl and mixing them together. It’s so handy to take this out of the refrigerator, eat the next morning and repeat the entire progress again. Add all of the ingredients to a bowl and combine everything, give it a good stir. Place in the refrigerator overnight. The chia seeds and oats will swell and expand overnight. The next day you should be presented with some creamy oatmeal. Garnish with additional banana, blueberries and a drizzle of coconut nectar. This looks good, I am definitely trying this! Wow!! What a bonus! Just the thing I needed in my kids life! I am sure they will go bonkers for it, hopefully! Do you do a newsletter for this site? Thanks Lucy, I love making recipes that are child friendly. I hope they love this quick and convenient breakfast. If you type your email address in the subscription box in the right hand side of the page, you get access to my new recipes. mm, i Love chia seeds! definitely have to try this combo! Can anyone think of a sub for oats? My guy is allergic to all oats. Sorry to hear that Ann try millet flakes instead they are naturally gluten free and the only substitute I can think of that will work in place of oats. Thanks, I’ll try cooked millet and see how that works. Love the idea. You are welcome Ann. Let me know if you need any more assistance.